A Year To Expand: Weekend Fun! I had a great weekend. On Saturday I met up with a dear friend at the Journeys Victoria Quilter's Guild Show and Sale. It was absolute bliss to just walk around together, sans kids, and fawn over all the different fabrics and quilts. I should really save all my fabric purchasing for craft fairs and shows, the deals can be really good. Considering I still have fabric that I bought especially for Z, when I was still pregnant, waiting to be turned into a quilt, I was careful not to go overboard in my purchases. I ended up buying a panel of Halloween fabric from Satin Moon Quilt shop that will be perfect for turning into a trick-or-treat bag, and perhaps some decorative panels for the season. Z's first Halloween; I can hardly wait! 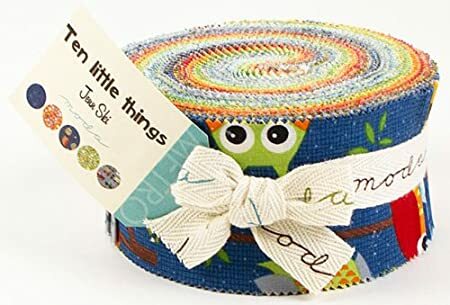 I also bought a jelly roll (I think that's what you call them) of Ten Little Things by Jenn Ski for Moda (from Hamels Fabric and Quilting). The colours are super cute, not too stereotypically boyish, and I think they would make the perfect bedspread for Zachary (or any other little kidlet that might be added to our family). That was Saturday. On Sunday the weather was absolutely fantastic. Hubby and I decided to take advantage of it, and as soon as the little one went down for his morning nap, we were outside. Hubby washed the cars while I worked on planting tomato plants. We have this planter right below our living room window. Since our house faces South, the planter gets a TON of sunlight, but very little water as it's protected by the roof overhang. It's also gets protected somewhat from any late-spring frost. We're hoping the heat will help produce some great tomatoes, as long as we keep it well watered, and hopefully the dear aren't keen on coming that close to the house (I'm not banking on it). As you can see, I need to get a couple more tomato cages. In other garden news, through the act of weeding our veggie garden, we discovered that we already had a crop of radishes for eating. Can I just say that there aren't a lot of recipes out there for radishes outside of the realm of salads? These grow great, not sure how the two of us are going to eat them all though! By this point, little Z had woken up from his nap, and was outside with us, under the protection of a beach umbrella, watching mom and dad huff and puff in the sun! Aside from that, my brother stopped by for a visit, and helped me plant two bushes/vines that I bought during the week. The top one is Star Jasmine. We planted it by the fence, and I'm really hoping that with minimal training, it'll take over the side of the fence (there's not much nice over there at the moment. The bottom image is a shrub called Golden-Leaved Mock Orange. All I know is, I like the bright green foliage, it's supposed to bloom in the summer, it can grow to 2m x 2m in size, and it only cost me $12.99 at the garden center. Score! Anyone else get up to some fun over the weekend? I'm so jealous that you got to go to that sale! Not that I should be buying anything anyways...I'm beyond broke! I love those prints that you scored! Tomatoes should do well in that spot. They'll need lots of water, though--it's a hot spot! Mock Orange is lovely: a BC native and one of my personal favourites. I didn't know there was a golden leaved variety. It'll be interesting to see how it comes along. An enjoyable post. I especially liked the part about "any other kidlet that might be added to our family"!